Dan Dannenmueller has found that the use of planer boards makes pulling lures more efficient for him than using more traditional methods. 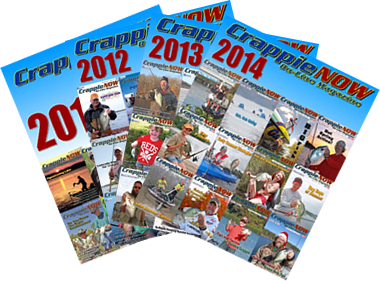 Crappie fishermen are a resourceful collection of individuals. They take time-honored traditions and make them better. They develop new techniques and make them their own. They’ve even been known to borrow tactics from other types of fishing. Their imaginations know few limits. Such is the case with the continued rise in popularity of planer boards. Borrowing a trolling technique once reserved for the walleye world and one that originally evolved in saltwater, crappie fishermen far and wide have come to appreciate the fish-catching effectiveness of fishing under planer boards. Count Yamaha pro, Dan Dannenmueller, among the believers. When he sought to improve his long-lining techniques, he never totally resolved all the issues because of the variables involved. He turned to Offshore Tackle planer boards as an alternative and used all the variables to his advantage. Dannenmueller emphasized the need to make a secure connection with the line under the “teeth” of the front snap on an OffShore Planer board. One event in particular illustrates just how effective planer boards can be. 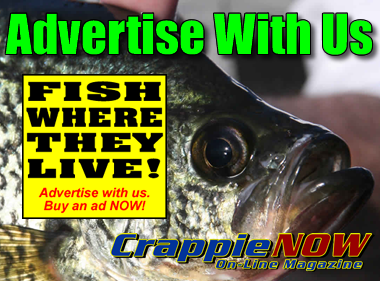 “Specifically it was the Crappie Masters Grenada championship in the fall of 2016, and we were still in summer-time patterns,” Dannenmueller said. “Summer-time fishing is a great time to use the planer boards. I was pulling crankbaits and Road Runners with Bobby Garland plastics. “The fish set up perfectly for pulling planer boards. They were on ledges 12-14 feet deep, and they were just off of a 12-foot drop, hanging out there suspended off that edge. The bait was also out there. To the uninitiated, the use of planer boards to pull lures looks like a complicated maze. Dannenmueller acknowledges the complexity of the technique and the hesitancy of inexperienced fishermen to use planer boards. However, mastering a few basic concepts allows just about anyone to effectively apply the technique. 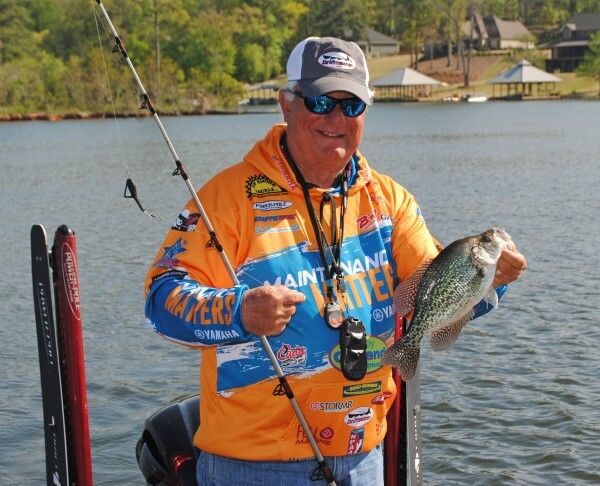 A situation with an eager-to-learn young angler, however, reveals how quickly planer boards can become a go-to approach to crappie fishing. Dan’s setup includes a larger model planer board with a flag on the outside of the spread with smaller mini boards on the inside. Rigging is the initial obstacle to overcome. 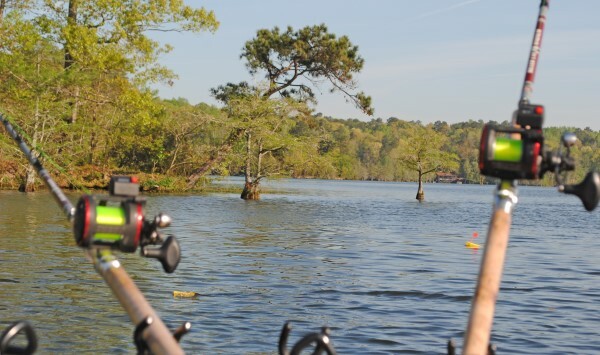 A standard approach carries the main line from the reel through two snaps on the planer boards, which are designed to run on either the left or right side of the boat. Dannenmueller emphasized the need to make a secure connection behind the “tooth” on the front snap so that the board runs straight. From the board, the line continues at a varying length, to an Off Shore Tackle Tadpole, a gliding weight that provides stability and allows lures to run true. The length of the line from the board to the tadpole determines the depth of the lure. “You can run them five feet deep or you could run them 40 if wanted to,” Dannenmueller said. The Road Runner is tied to the top leader, which is about two feet long, and generally runs about two feet above the other bait, which is attached to a three- to four-foot leader. That rigging targets crappie in both the top and bottom of a school. To further facilitate the process, Dannenmueller uses a smartphone app from Precision Trolling Data to determine precise placement of the lure in the water column. Plugging in variables like line size and brand, trolling speed, and lure type provides an exact depth at which lures will be running. The Off Shore Tackle planer boards come in three sizes, and Dannenmueller employs a combination of “minis,” OR38 models specifically designed for crappie fishing, and the larger, original OR 12s. He runs an OR12 on the outside on each side of the boat for ease in visibility and then fills out the spread with three OR38s inside. The bigger planers come with a flag that pops up when a fish hits while the smaller ones sink or bob in a manner similar to a cork when a fish loads up. The boards are staggered at intervals starting at about 50 feet from the boat. The wide spread negates any spooking factor created by the trolling motor. 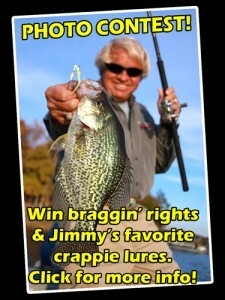 He pulls the boards with tackle heavier than is normally associated with crappie fishing. He uses B’n’M Silver Cat Magnum rods and Abu Garcia Alphamar Line Counter reels. The heavier rods allow him to snap the line free from the front of the planer board when a fish hits. He fills his reels with 10-lb. Gamma hi-vis mono and uses the same line, in clear, for his leaders. “I could use fluorocarbon, but it sinks and adds another variable that has to be figured in,” Dannenmueller said. He mounts the rods in Driftmaster rod holders specifically designed to fit the contours of his Ranger boat. The Driftmasters are built with exact angles that allow for a perfect spread of boards and prevent lines from crossing. The jig/crankbait duel rig proves effective for Dannenmueller although he will occasionally use a double-jig rig. The tadpole and line length are the primary factors that control lure placement, so Dannenmueller can use jig sizes that best fit the fishing conditions. He normally starts with a 1/16th-oz. Road Runner head with a two- to three-inch Bobby Garland Stroll’R but might bump all the way to a one-ounce head on big-fish lakes like Grenada. Dannenmueller normally uses standard-sized, 300-model crankbaits from Bandit and Pure Fishing but does vary sizes at times. He emphasized the need to make sure the crankbaits run true. 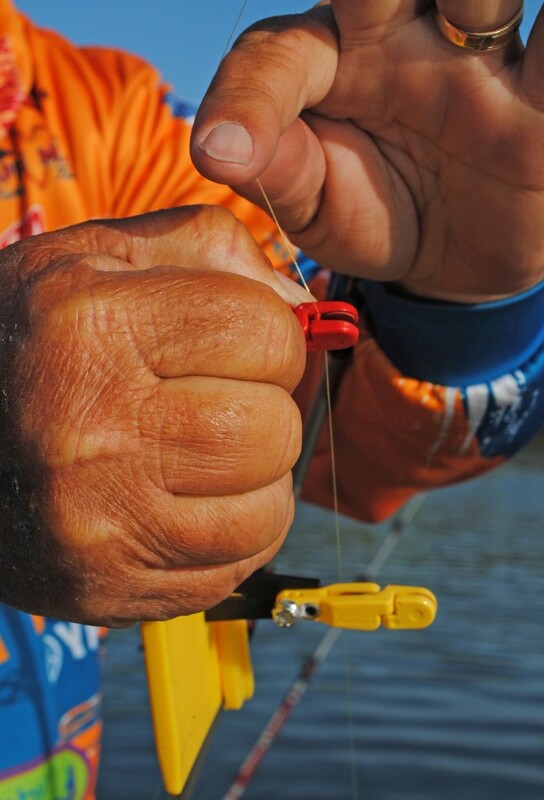 Off Shore offers a tool, the EZ Crankbait Tuner, that helps the lures run to perfection. Planer boards can be used effectively at just about any time of the year, but the post-spawn from late spring through the fall, proves ideal. August is a perfect month to try the technique. “Post-spawn, in late spring and summer time, is absolutely prime for planer board fishing,” Dannenmueller said. “Those fish will suspend out off of points and in deep water and this technique is perfect to target those fish. August fishing is strictly summertime patterns with deep flats and ledges being good places to start. Generally, the problems of pulling the boards are minimized after just a few attempts. Dannenmueller emphasized the need to maintain exact speed, to make sure the screws are tight on the boards, and to keep the boards free from debris like grass. Otherwise, the boards run to perfection. Regardless of the time and place, planer boards are effective tools in the crappie fishing arsenal. Despite their apparent complexity, boards can be employed quickly and easily. “Planer boards will be my go-to presentation for pulling baits from now on,” Dannenmueller said. “Off Shore Tackle makes great products that work well without much adjusting at all. 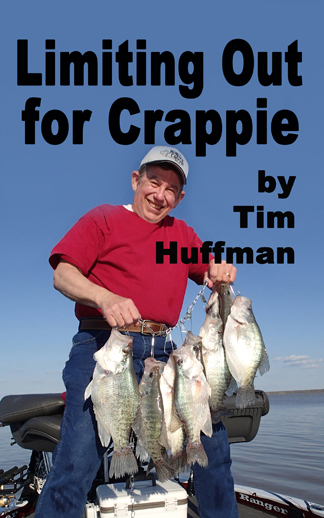 For those crappie fishermen who constantly develop, evolve, tweak, and borrow, more efficient and productive fishing is always the point, a means to bigger and better catches of crappie. Planer boards provide that advantage.